[SG] Park Palace | 乐宫 - a chamber of Oriental imperial treasures for Chinese New Year! 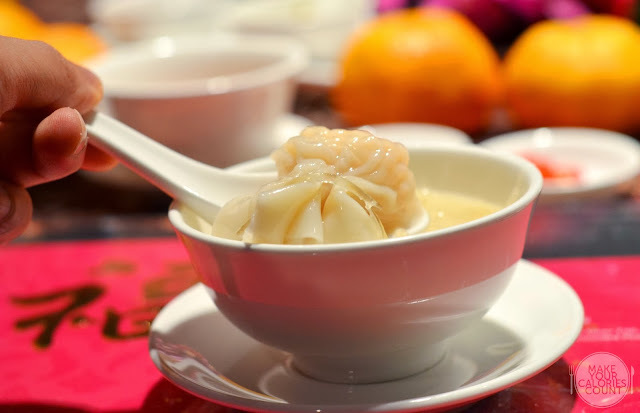 As Chinese New Year approaches, we are on the lookout for the top epicurean offering in Singapore to share with our foodie readers. 2014 marks the year of Horse and as the Chinese saying goes "龙马精神", it is important to march into the New Year magnificently with a strong spirit and stride! 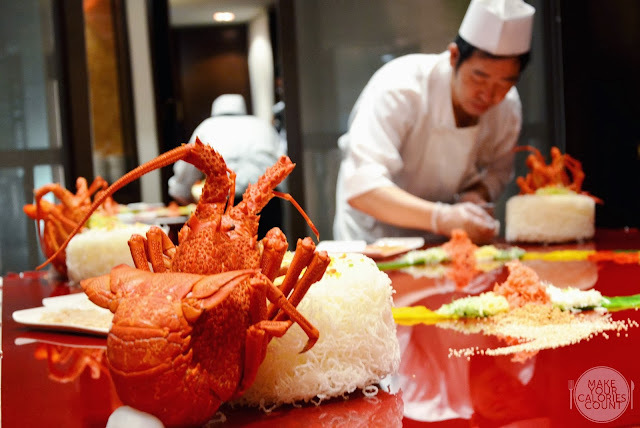 It is the time of the year where Chinese restaurants each line up a suite of celebratory offerings that symbolises prosperity and happiness fit for reunions and lavish feasting with family, friends and business partners. 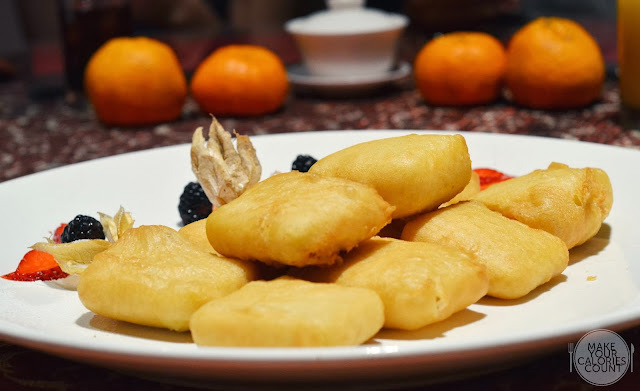 While we search for the best venue to host our family's reunion dinner, we were attracted by the sheer extravagance of the festive menu offered by Park Palace at Grand Park City Hall. Lauded for its Cantonese gastronomy, the executive chef originates from Hong Kong and brings with him a highly desired set of culinary skills. Can this Oriental paradise live up to its name and impress us? Let the taste buds do the talking! Being shown into a partitioned part of the restaurant, it gives diners a sense of exclusivity and the intimateness presents a perfect opportunity to renew your kinship or friendship with family members or guests. 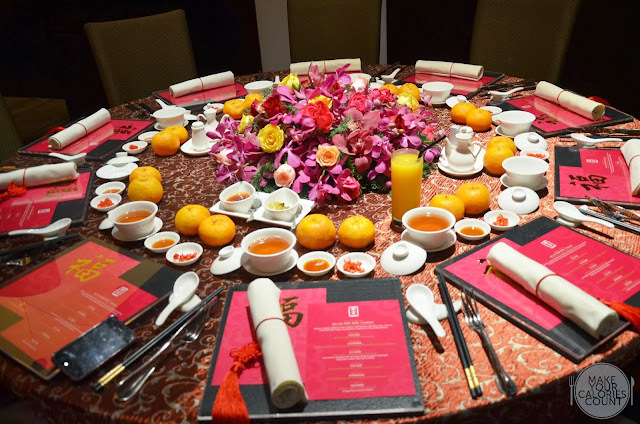 Apart from the warm greetings received from the staffs upon arrival, the elegant presentation on the dining table highlights the exquisiteness to expect from the meal to come. What does Yu Sheng ("鱼生") really mean? For the benefit of those who are not familiar with the dish, Yu Sheng is actually interpreted as a homophone for the Chinese phrase "余生" which means an increase in abundance. 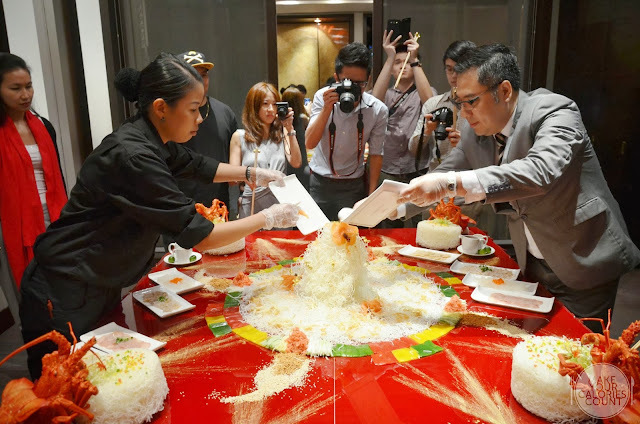 As such, Yu Sheng is considered a symbol of abundance, prosperity and vigour. 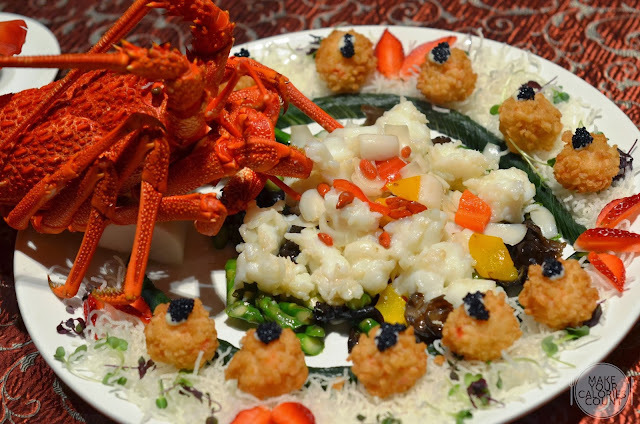 The signature Shunde Yu Sheng has a shimmering gold boost with gold flakes to make it a touch more premium. Ready for the classic 'Lo Hei'! 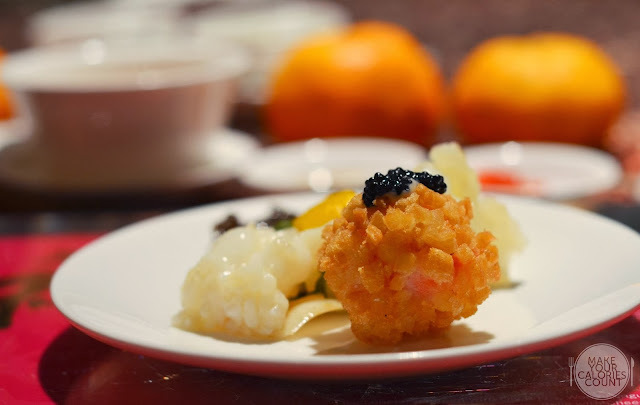 At an equally matching imperial price of S$888/++, this luxurious Yu Sheng boasts five prized treasures of the sea - abalone, lobster, geoduck clam, salmon and hamachi, topped with caviar and fish roe plated in the shape of cherry blossoms. It is positioned so as to represent the blossoming and reaping of fruits of success in the New Year! 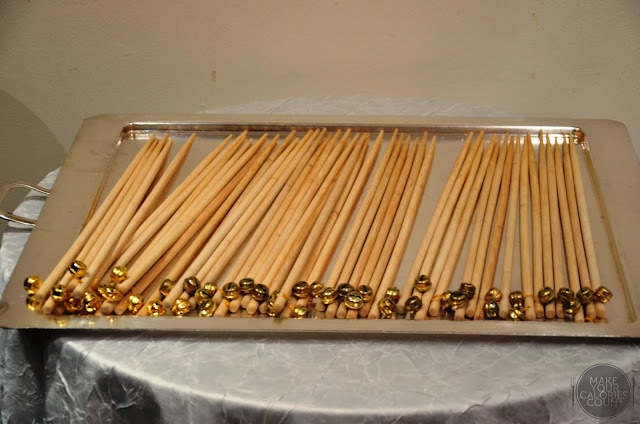 A special added touch to the long chopsticks provided - bells attached for that lovely ring when you do the tossing bottoms-up! The classic "Lo Hei" ("捞起") or Prosperity Toss usually marks the beginning of a Chinese New Year meal as it is believed to bring an auspicious start! Let us toss to everlasting fortune, good health and success in the New Year as the staffs recite words of blessing! 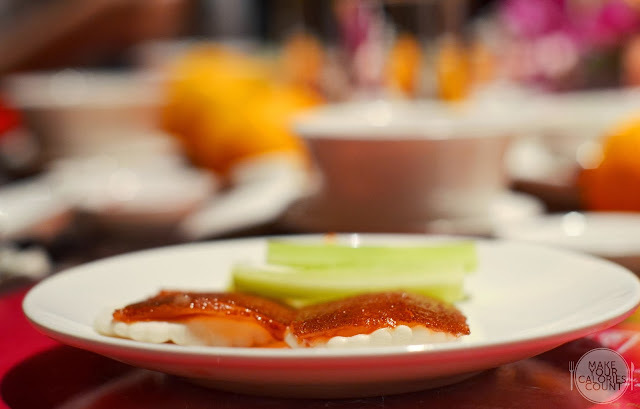 Apart from serving the usual sweet version of the Yu Sheng, Park Palace offers a uniquely savoury treat through this impressive-looking dish guaranteed to wow your guests. 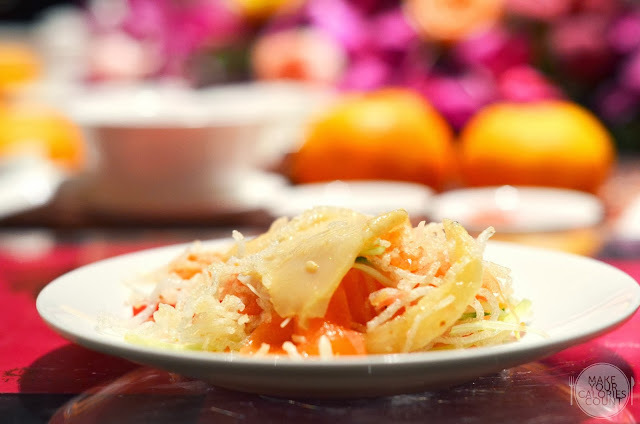 Instead of the traditional salad of radish, carrots, pickled ginger and pomelo, crispy fried vermicelli was used which provided the much desired texture. The savouriness of the dish derived from the fragrant peanut oil and light soy sauce drizzled sparingly, allowing the freshness of the prized seafood to come through to diners' palate. One could always request for additional light soy sauce to adjust to your preference. 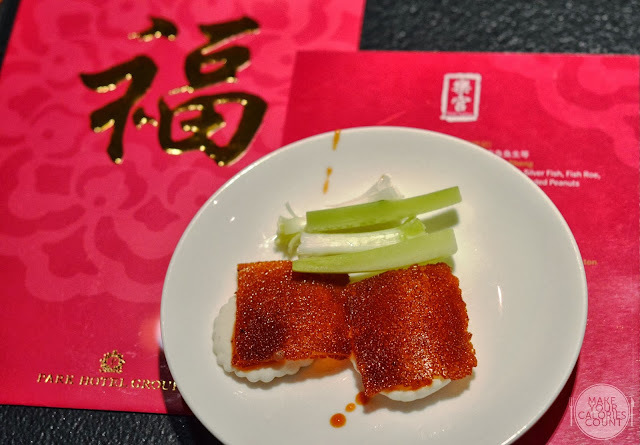 This is a stark contrast from the usual Yu Sheng dishes served in Singapore, which typically uses sweet plum sauce that may sometimes have a cloying sweetness which satiates one's appetite. The ingenious way to present the dish was to use crunchy silver fish in the tossing and to separately portion a generous serving of hamachi to each guest on the table. This ensures that everyone has an equal opportunity to be pampered in terms of culinary tasting. Personally, I felt that all respective seafood such as the abalone, geoduck clam were of prime freshness but what was particularly commendable was the hamachi. A seasonal favourite in Japan, especially in the colder months, it tends to have extra fat which makes it all the more salivating! Are you feeling slightly overwhelmed, by the price perhaps? 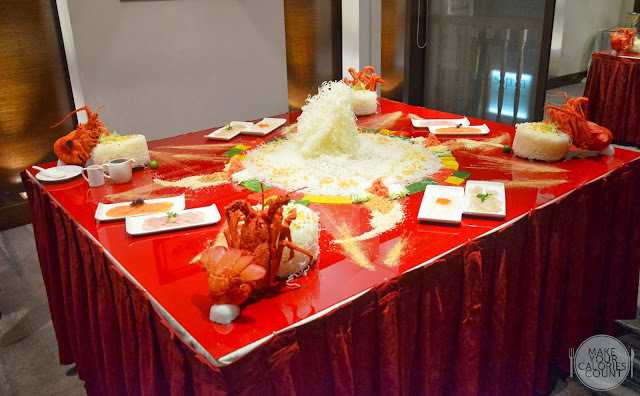 Admittedly, that was my initial reaction too but Park Palace offers a much more affordable Hamachi and Silver Fish Golden Shunde Yu Sheng priced at S$88/-, which would cater to the masses so we can all enjoy without feeling the pinch! 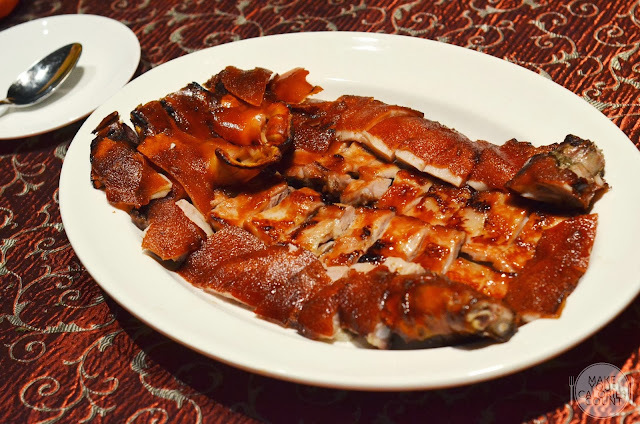 One of the nicest necessities of a traditional Chinese feasting meal cannot do without the grace of a golden-brown delicious looking roasted suckling pig! The skin was very crispy and sliced to a uniformed thickness or thinness in this case! Highly palatable and certainly one of the favourites among the guests at the table! I personally felt that the wrapping for the wanton tasted a little too starchy for my liking though this was compensated by the natural sweetness and crunchiness from the prawn. This was one of my favourites among the dishes tried as I generally have a preference for varied textures, tastes and elements within the same dish. The live lobster was sautéed with lily bulbs, wood fungus and asparagus. Complementing the main was the deep-fried lobster balls with cheese. Enjoying it in one mouthful was divinely good as you could taste the natural sweetness from the live lobster coupled with the savouriness of the cheese as it explodes! The light batter coating the lobster ball was deep-fried to a delicious golden-brown colour and had a nice crisp and crunch texture to complement the tender yet bouncy lobster meat. 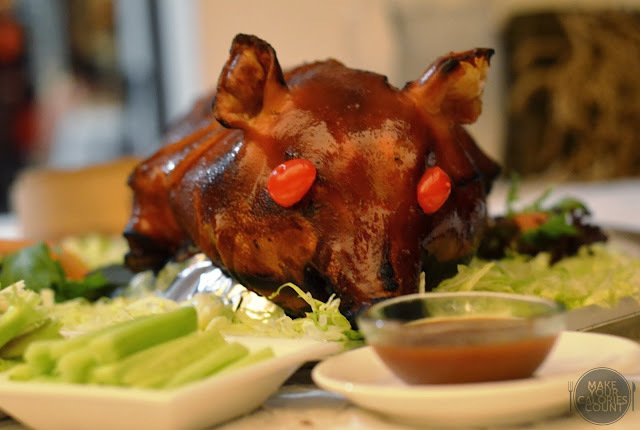 From the same suckling pig served above, this oven-baked version had a beautiful and tantalising lemongrass fragrance and taste to it which was subtle yet sufficient to titillate one's senses. You would however need to dab on the sauce that settled to the base of the plate. My only complaint was that I had probably expected too much for the lemongrass flavours to be completely infused into the meat (like a lemongrass smoked version) as it was not strong enough to pack a punch. This was however my own expectations. The protein itself was tender, moist and juicy. Paired with the crispy skin atop, it would easily win the hearts and stomachs of many! One of the signatures of the Chinese New Year festive menu is this savoury pen cai with braised pig trotters. Stacked with three layers within the casserole hot pot, it comprised 18 luxuriant ingredients packed with decadent flavours. 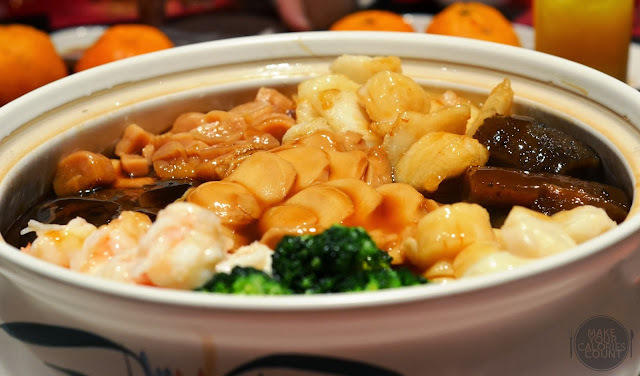 With delicacies such as dried scallops, abalone, pork belly and fish maw, this dish symbolises more than the auspicious beliefs of goodness but is also rich in collagen! Having been simmered for more than five hours on the stove, each of the ingredients was perfectly braised and cooked with a fragrant and viscous sauce to coat. The only drawback for me was that the pig trotters was a little stiff for my liking as I was expecting it to be more of the 'melt-in-your-mouth' tender. It was again a case of matching expectations. I always think that the perfect way to end a sumptuous meal is a nice dessert that wraps up the calories and mood harmoniously since it is the last course of the meal. I was having a similar discussion with a colleague in the office few days ago and unanimously agreed that Chinese cuisine usually lacks a highly memorable dessert to end off the meal. Food for thought - how often do you walk away from a Chinese meal thinking that the dessert was the best course of the meal? 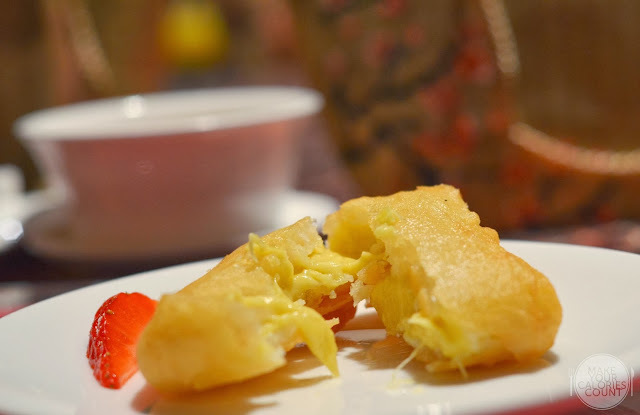 While this was a favourite among the invited guests at the table with the nice crispy batter and premium durian puree on the inside, I struggled to find it being the best complementing dessert on a luxurious Chinese New Year menu. The various elements to this dessert were spot-on - the batter was light, deep-fried to a nice golden brown in clean oil; premium bitter-sweet durian puree that tasted rich; While the dessert was good as a standalone sweet treat, I would have imagined that a classic double-boiled bird's nest or hasma with red dates and goji berries might be a better fit and left the dining guests an impressive dining experience with all the luxury ingredients of Chinese cuisine. Apart from the roasted suckling pig, all the dishes tried are exclusively available during the Chinese New Year period which is on offer now till 14th February 2014. Overall, I felt that the service rendered was immaculate and the intended exclusivity for diners was definitely achieved. 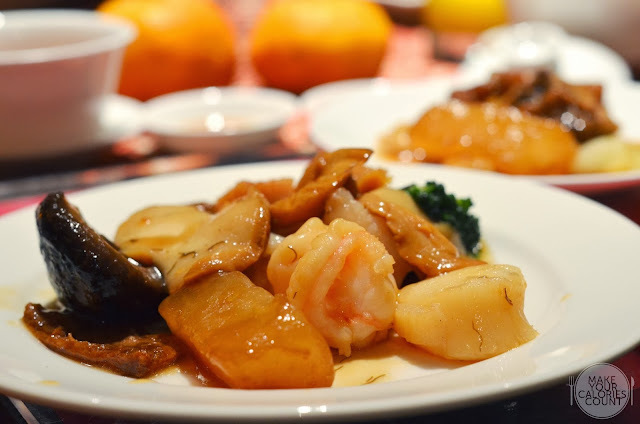 The quality of the food served was certainly deserving of its reputation of serving Cantonese gastronomy. For interested foodies, the pen cai and Yu Sheng are also available for takeaway orders. *Special thank you to Belda and Park Hotel Group for extending this exclusive food-tasting invitation to mycc! This article was also reproduced in NextInsight.